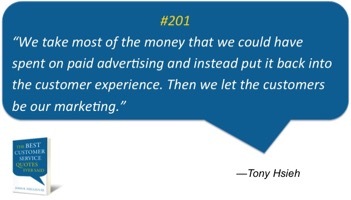 ROI on Advertising vs. Customer Service? Now is the time to shatter the myth that advertising delivers a higher ROI than customer service. This is the time of year every department in every company is fighting for an increase in their budget. Determining what they are allowed to spend for 2017, especially the budgets of advertising versus customer service. The only way to win the battle is to prove which budget will produce the company a better ROI. In 2016, the fact that this is even still a debate is a sign of old paradigm thinking by too many senior executives. The shortsighted obsession of constantly bringing new customers/traffic to your business is significantly more expensive than building an incredible customer experience. Are you Penalizing Brand Loyalty? Repeat customers spend more $$$ than new customers. Repeat customers give higher satisfaction scores. Repeat customers refer more than new customers. You need five new customers to produce as much as one repeat customer. A 5% increase in customer satisfaction can increase a company’s profitability by 75%. 80% of your company’s future revenue will come from just 20% of your existing customer base. 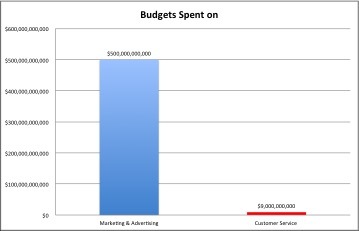 What if we Reversed the Spending on Advertising vs. Customer Service? Companies spend millions creating and advertising their brands, yet the customer’s experience is what drives customer perception. If you take really good care of your existing clients, they will generate more new customers than any kind of advertising campaign ever could.